The Endocannabinoid system was first discovered in the 90’s by Dr. L. A. Matsuda. He first described the functional expression and structure of the cannabinoid receptor, CB-1. Scientists discovered that the primary intoxicating substance contained in marijuana was a complex network of cannabinoid receptors. These receptors were found in the peripheral and central nervous system of the human body. And since then, there have been other discoveries of more cannabinoid receptors. One of the major functions of the Endocannabinoid System is that it helps to balance most of the vital psychological body functions. It allows for stability and balance from inflammation, sleep, appetite, pain, mood, memory, and reproduction. Simply put, the ECS helps with homeostasis regulation ensuring all the systems in the body work in sync with one another. For example, some people who consume cannabis do so to get its mind-altering effects, some others, relief. But did you know that if our body was without a biological system that’s capable of a chemical interaction with the chemical compounds in cannabis, the therapeutic benefit or the ability to get high with it cannot be experienced? Cannabinoid receptors: these are mainly found on the cell’s surface. Endocannabinoids: made up of small molecules whose role is to activate the cannabinoid receptors? Metabolic enzymes: they break down endocannabinoids immediately after use. Cannabinoid receptors are found on the cell’s surface, they ‘listen’ to the changing conditions happening outside the cell, transmitting this information back inside the cell, initiating the various appropriate response. Two major types of cannabinoid receptors exist: cannabinoid receptor 1 and cannabinoid receptor 2. Cannabinoid Receptor 1: the CB1 are mainly found within the brain and the central nervous system. The natural endocannabinoids combined with cannabinoid THC found in cannabis binds with CB1 as a result of their similarly built molecular structures which brings relief to patients from nausea, pain, depression and many more. Cannabinoid Receptor 2: These receptors are mainly housed by the immune system; they bind with the endocannabinoid 2 – AG and cannabis’ CBD. They regulate appetite and some functions in the immune system like pain management, inflammation and more. There are two major endocannabinoids, they are anandamide and 2-arachidonoylglycerol (2-AG). The endocannabinoid is naturally produced by cells within the body. However, you will find 2-AG most in the brain with a very high concentration than anandamide. 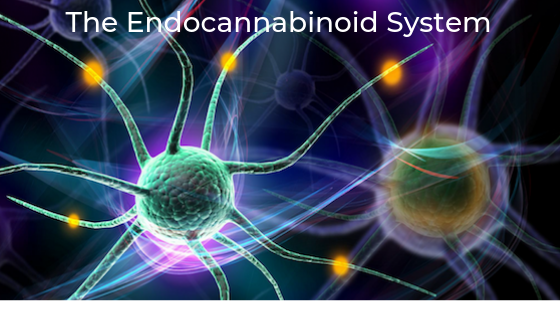 These endocannabinoids are molecules found within the cell membranes. They are synthesized only on demand. What this implies is that they are produced only when they are needed. They are not packed and stored to be used later unlike other biological molecules. No doubt, scientists have discovered other effects of endocannabinoids that are not mediated through CB1 or CB2 receptor. They include health-related effects on pain, blood pressure, cancer cell growth, and inflammation. In fact it has been discovered that asides CB1 and CB2, endocannabinoids can bind to at least eight other receptors. Once the body makes use of the needed endocannabinoid, the metabolic enzymes quickly destroy them. We have the FAAH and the MAGL enzymes. The FAAH is responsible for breaking down anandamide while MAGL is responsible for breaking down 2-AG. The job of these enzymes is to ensure that these endocannabinoids are available for use not longer than the necessary time. This makes endocannabinoids unique and stands as the differentiating factor from all molecular signals within the body, unlike the neurotransmitters or hormones which can be stored for later use. Just like every other complex biological system, deviating from psychological homeostasis either due to chronic pathological conditions or external factors is not advisable as it can make the ECS lose its selective mode of action. Activating the endocannabinoid system via cannabis consumption or other means is also not a cure-all. This entry was posted in CBD and tagged CBD, CBD Oil, Endocannabinoid System, The Endocannabinoid System.